Edward Snowden, speaking via video screen from his hideout in Russia, told an audience in Austin, Texas, that efforts to improve encryption must be accelerated. WASHINGTON — America’s spy agencies are so focused on ‘‘mass surveillance’’ that they have missed clues about terrorism, such as last year’s Boston Marathon bombing and an attempted attack on a jetliner on Christmas in 2009, former intelligence contractor Edward Snowden said Monday. In an hourlong video discussion hosted by the South by Southwest music, film, and technology conference in Austin, Texas, Snowden, who is living in asylum in an undisclosed location in Russia, said the National Security Agency’s efforts to collect information in bulk have backfired. ‘‘We’ve actually had a tremendous intelligence failure because . . . we’re monitoring everybody’s communications instead of suspects’ communications’’ — a situation, he asserts, that has ‘‘caused us to miss’’ intelligence. Snowden, who faces espionage charges for disclosing top-secret intelligence documents to several journalists, has prompted a global debate about surveillance and forced the US government to be more transparent about once-classified programs. His actions have drawn harsh criticism from senior US officials, who contend that the leaks have put national security at risk, as well as approval from technologists and privacy advocates, who say the leaks have forced tech companies to make their systems more secure. Snowden, who was using a Google videoconferencing program that ran through seven proxy servers to mask his location, used much of his talk to urge companies and technologists to develop and adopt easier-to-use encryption. ‘‘It has to happen seamlessly,’’ he said. He also said that neither the Chinese nor the Russian governments possess any of the information he took. Snowden spent a short time in Hong Kong before arriving in Moscow last year. The intelligence failures Snowden alleged are not clear-cut. The Christmas 2009 bomb attempt involved a failure to connect and understand the information agencies possessed. In the Boston case, the FBI followed up on a tip from Russian authorities about one of the suspects, Tamerlan Tsarnaev, but found insufficient grounds to open a criminal investigation. The documents shared with journalists by Snowden have resulted in reports about the NSA’s collection activities overseas and in the United States. Last October, for example, The Washington Post reported the NSA had infiltrated the overseas links between Google and Yahoo data centers. Following that story, both companies rushed to say they were encrypting the links between their data centers, and Yahoo said it would apply encryption by default to connections with users, something it had resisted. 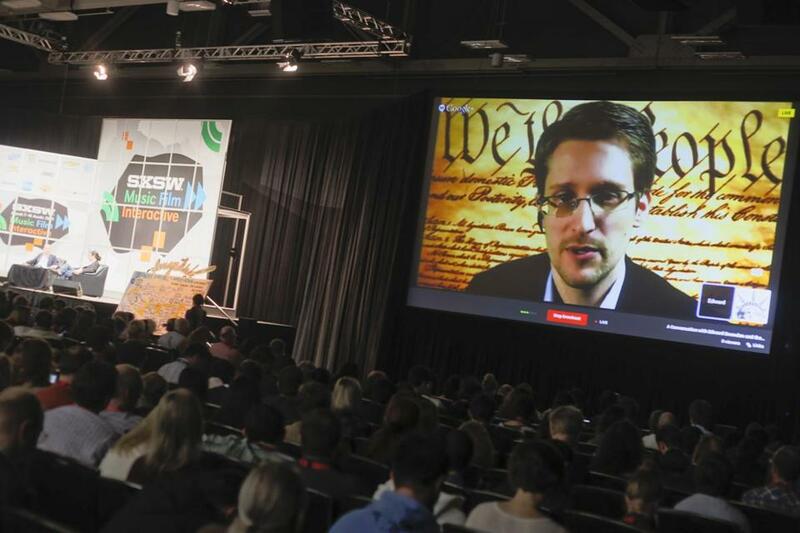 During the videoconference, an image of the US Constitution provided a background for Snowden. The session was conducted by ACLU lawyer Ben Wizner, Snowden’s adviser.